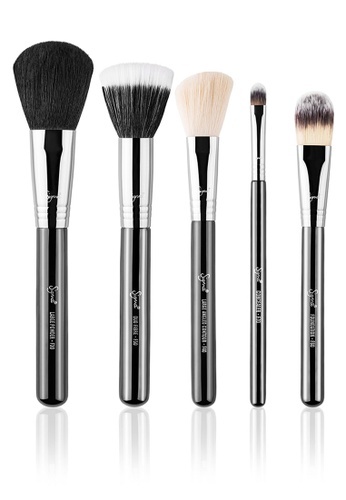 Get the biggest bang out of your buck with the Basic Face Kit brush set by SigmaÂ®. This brush set contains five professional quality brushes (F30, F40, F50, F6- and F70) for the face. Perfect for application of liquid, cream and powder formulas, this face brush set is just the thing you need for an ideal and flawless all over face make up application. From foundation application to concealing to contouring, this set has got you all covered. Can't find Basic Face Kit in your size? Uniform blending of powder products onto the face and body. Use the angle to softly contour the cheekbone. Can also be used to apply blush. Can be used with powder, liquid or cream products. Conceal the hardest to reach areas such as around the nose and eyes.